Wireless communications technology enables us to seamlessly access various multimedia services such as stored multimedia (e.g., video on-demand), live streaming (e.g., Internet live sport networks, Internet radio stations), and real-time interactive streaming (e.g., online games, video conference, e-education). Consequently, wireless communications technology has rapidly gained a crucial role and become an important aspect of life. There is a strong, credible body of evidence, suggesting that mobile network operators are facing many formidable tasks but exciting areas of endeavor. Of most concern is the increase in ever-growing wireless/mobile devices and the huge demand in data rates associated with this. It is predicted that the number of mobile-connected devices will have exceeded 11.5 billion by 2019 (nearly 1.5 mobile devices per capita), which poses a huge traffic demand for ubiquitous communications. On the one hand, it is anticipated that we will witness an up to 10,000- fold growth in wireless data traffic by the year 2030. The future 5G cellular network is expected to achieve as much as 1000 times data rate relative to its current 4G counterpart. On the one hand, as many as 50 billion devices connected to the Internet by 2020 request seamless connectivity and mobility. Data rates are projected to increase by a factor of ten every five years, and with the emerging Internet-of-Things (IoT) predicted to wirelessly connect trillions of devices across the globe. Without novel approaches, future mobile networks (5G) will grind to a halt unless more capacity is created. To address the aforementioned challenges of wireless communications and networks for 5G and beyond, this special issue focuses on the following topics: QoS/QoE mechanisms for wireless communications and networks; 5G wireless heterogeneous networks: design and optimization; Sensing technologies and applications for 5G; 5G wireless communications and networks for surveillance and management; 5G Cognitive networks and IoT; experimental results, prototypes, and testbeds of 5G wireless communications and networks; integration and co-existence of 5G wireless communication and network technologies; energy efficiency (harvesting and saving) wireless protocols and algorithms for 5G; security and privacy concerns in 5G wireless communications; NOMA, full-duplex, massive MIMO; and green 5G multimedia wireless networks. This special issue includes fourteen high-quality papers. In the first paper entitled “A Physical Encryption Scheme for Low-Power Wireless M2M Devices: A Dynamic Key Approach”, the authors study a lightweight cipher approach, to enhance the security performance of M2M systems. The underlying idea of the proposed dynamic key encryption scheme is to leverage the random and dynamic nature of the physical communication channel towards reaching a high security level with minimal overhead, latency and resources. In this way, the obtained dynamic key can be changed frequently upon any change in channel parameters. The security performance of the proposed cipher scheme are validated by experimental simulations to demonstrate its efficiency and robustness. In the same research stream of physical layer security, the authors of the second paper study “A Physical Layer Network Coding (PNC) Based Modify-and-Forward with Opportunistic Secure Cooperative Transmission Protocol”. In this paper, a new secure relaying scheme, i.e., physical layer network coding based modify-and-forward, is investigated in the scenario when the eavesdropper can overhear the message from both the source and the relay and also know the imperfectly shared knowledge between the relay and destination. By employing PNC at the relay with encrypted key, the proposed scheme has been shown to provide a higher security compared to the conventional decode-and-forward and cooperative jamming schemes with respect to various channel conditions and target secrecy rates. Furthermore, the authors propose an opportunistic secure transmission protocol by finding the secrecy rate thresholds. The objective is to determine the optimal scheme with or without the assistance of the relay to dynamically select the optimal transmission strategy for achieving the lowest generalized secrecy outage probability. In the third paper entitled “Performance Analysis for Secure Cooperative Systems under Unreliable Backhaul over Nakagami-m Channels”, a friendly jammer is considered to confuse the eavesdroppers and a two-phase transmitter/relay selection scheme is proposed to transmit the signals from the source to the destination. In this way, the signal-to-noise ratio at the relays is maximized and the jamming signal-to-interference-plus-noise ratio of the eavesdroppers is minimized to gain high secrecy performance. It is important that the degree of cooperative transmission and backhaul reliability are key parameters in the system that determine the secrecy performance. 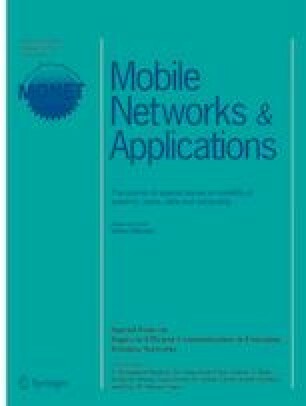 As one of the most promising technologies for the upcoming 5G wireless networks, the joint design of the delay-aware user association and power control problem in the network uplink is considered in the fourth paper - “Delay-Aware User Association and Power Control for 5G Heterogeneous Network”. The problem of interest is to minimize the overall power consumption subject to strict delay constraints. The original problem is then converted to solvable forms and then solved by successive convex approximation (SCA) algorithm. For the purpose of parallel implementation, the authors further develop a distributed algorithm based on the combination of SCA and alternating direction method of multipliers. The simulation results show that the proposed algorithms can achieve better performance than the existing schemes under various system parameters. In the fifth paper entitled “State Management Function Placement for Service-based 5G Mobile Core Architecture”, to take advantage of network function virtualization and software-defined networking, the authors formulate a multi-objective optimization problem placing state management functions in service-based 5G core networks over geo-distributed cloud infrastructure. The problem takes into account two objective functions including traffic load processed by each set of state management functions and state transfer cost. The proposed solution can overcome the problems of high state-transfer cost and high traffic load for better balance between deploying state management functions to all cloud centers and using only one state management function for the entire network. To cope with the demand for ultra-high-speed data rates and low latency networks as a result of enormous data transferred over the Internet, the authors of the sixth paper “Li-Fi Positioning for Efficient Millimeter Wave Beamforming Training in Indoor Environment” study the millimeter wave (mmWave) band and the visible light band, i.e., light-fidelity (Li-Fi), in wireless access networks. In this paper, an efficient Li-Fi/mmWave integration paradigm orchestrated by Wi-Fi signaling is introduced, then a mmWave beamforming training (BT) based on Li-Fi localization is proposed. The wide spread of light emitting diode (LED) bulbs used as Li-Fi atto-cells accompanied with their high accurate positioning enable the use of too sharp (pencil) mmWave beams using a few number of beam switchings. This contributes to reducing the mmWave BT complexity while increasing the coverage area. The effectiveness of the proposed mmWave BT, in terms of complexity, outage probability and misalignment probability, is also demonstrated. Particularly, almost a 98.7% reduction in BT complexity is achieved by the proposed Li-Fi based BT over the Wi-Fi based one to obtain an average received power ratio value of −1 dB using a 2.8° beamwidth. Moreover, a nearly 97% and 98% reduction in BT complexity are achieved by Li-Fi over using Wi-Fi for obtaining a 0-outage probability and 0-misallignment using 5° and 2.8° beamwidths, respectively. To improve the efficiency of content dissemination in 5G networks, the seventh paper “Performance Analysis of the Content Dissemination Mechanism with Proactive Content Fetching and Full-Duplex D2D Communication: An Evolutionary Perspective” considers of proactive content fetching and full-duplex device-to-device (D2D) communications, namely PCF-FD mechanism. FD technique is utilized to establish more D2D links and increase the area spectral efficiency (ASE). Based on stochastic geometry, the authors derive the recursive formula of content caching probability between successive time periods. In addition, the successful offloading probability (SOP), ASE and average energy consumption of a common request at a given time period are also obtained. The results show that the PCF-FD scheme achieves the largest content caching probability and outperforms other schemes in terms of SOP in all scenarios apart from the scenario of large user density and heavy load. Motivated to solve the problem of co-channel interference among users in small cells and macro cell, the authors of the eighth paper entitled “Quality-of-Service Aware Game Theory-Based Uplink Power Control for 5G Heterogeneous Networks” study a game theoretical framework for the optimal uplink power allocation for small cells, i.e., femtocell deployed underlaid macrocell. In particular, femtocell users play a non-cooperative game to choose the optimal power to maximize the sum-rate of the system. Furthermore, an iterative quality-of-service (QoS)-aware game-theory-based power control (QoS-GTPC) scheme is proposed to optimize the femtocell user power taking into account macrocell users’ QoS requirements. Simulation results verify that the proposed QoS-GTPC scheme significantly improves the sum-rate and reduces outage and interference, as compared with the conventional power control scheme. In the ninth paper entitled “Analytical and Experimental Performance Evaluation of Antenna Misalignment in Ka-band Wireless Links”, a mathematical model for the effect of misalignment of antennas due to mechanical vibrations and experimentally validate its accuracy in a Ka-band (26–40 GHz) transmission link is proposed. Based on this model, the robustness of 5G networks to antenna misalignments can be evaluated. The authors also show how the presence of misalignment in this type of systems induces an error floor observable in the bit-error-rate performance. The closed-form expressions derived through this paper are in perfect agreement with the experimental measurements from the implemented system. Providing seamless connections to the ever increasing density of high-mobility user equipments (UEs) is one of the important issues in 5G networks to accommodate exceptional services beyond the current cellular systems. To do so, in the tenth paper named “Tracking Area Update and Paging in 5G Networks: A Survey of Problems and Solutions”, tracking all the UEs, i.e., mobility management, while moving throughout the coverage area for the purpose of data-packet delivery is studied. This paper addresses a variety of problems that should be faced and discusses various solution schemes in terms of implementation complexity, latency, and computation overhead for both the tracking area update (TAU) and paging procedures. The authors emphasize a critique on the use of different types of UE mobility models, which are applied to analyzing the network performance and discussing some improvement schemes in 5G networks. The eleventh paper is on “Cooperative Cognitive Non-Orthogonal Multiple Access under Unreliable Backhaul Connections”, which investigates the performance of energy-harvesting communications with decode-and-forward relay in the presence of non-orthogonal multiple access (NOMA) multiple access and cognitive radio spectrum sharing. Theoretical expressions for all the outage probability of single and multiple transmitters and relays are also derived with respect to two strategies for selecting the best transmitter and relay. The outcomes reveal that the increase in the maximum transmit power at the transmitters, the power threshold at a primary user, the number of transmitters and relays, and the backhaul reliability, can improve the system outage performance. It is also shown that the power splitting fraction has a small impact on the system performance. Serving multiple users in the same resource block in non-orthogonal multiple access (NOMA) induces interference that limits the achievable rate for each user. Therefore, the authors of the twelfth paper “Maximizing the Number of Users in Clustered MIMO-NOMA Systems under Rate Constraints” solve the problem of maximization of the number of admissible users in the downlink multiple-input multiple-output (MIMO)-NOMA systems, under a total transmission power constraint and ergodic user-rate constraints. A closed-form lower bound for the achievable ergodic rate is obtained and a power allocation scheme is designed. An algorithm that computes the maximum number of admissible users is proposed for each of the user ordering strategies. Three users ordering strategies are compared in terms of the maximum number of admissible users and the capability of admitting far users from the base station. The thirteenth paper is on “Performance Analysis of MIMO SWIPT Relay Network with Imperfect CSI” in which the multiple-input multiple-output (MIMO) simultaneous wireless information and power transfer (SWIPT) relay network imperfect CSI is considered. In particular, the authors derive the exact and approximate closed-form expressions for outage probability. Using Jensen inequality, the upper bound for ergodic capacity is computed. Furthermore, the exact and approximate symbol error probabilities are also figured out. The Monte Carlo based simulation results are provided to demonstrate the relevance of the developed analytical results, showing that the system performance is significantly impacted by the CSI imperfection, number of antennas, and energy harvesting duration. The results can be used to quantify the effect of time delay or channel estimation error on the transmission antenna selection scheme at the source node and the relay node using DF scheme. The last paper in this special issue is “Power Efficient Clustering Scheme for 5G Mobile Edge Computing Environment”. In this paper, the authors propose a power-efficient clustering scheme (PECS) for the mobile edge computing (MEC) environment where all MEC servers are turned on. To do so, the power consumption model of MEC servers according to CPU loads is formulated by considering the power consumption behavior of the MEC server using CPUs with dynamic voltage frequency scaling. Then, using the power consumption model of MEC servers, the optimal number of clusters is determined to reduce the power consumption of the overall MEC servers. At the obtained optimal number of clusters in MEC, it is found that the CPU load of local cluster servers and member servers is balanced to minimize the power consumption. Finally, the results show that the proposed scheme achieves a 12.32% reduction in power consumption compared to an existing scheme while sustaining average delay of inflows processed in MEC servers at an acceptable level.